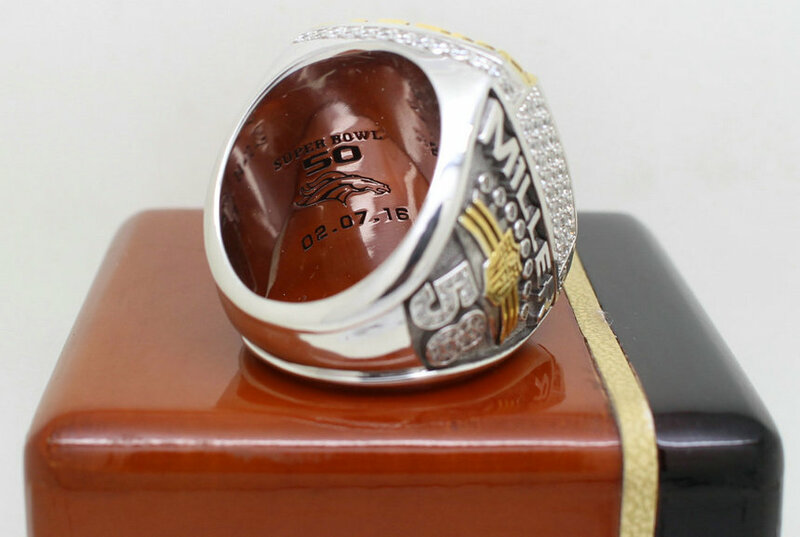 2015 Denver Broncos Super Bowl Manning/Miller Championship Rings [Super Bowl 50 Rings] - $39.00 : Trophies Art, Inc. Online Retail Store for Award Trophies, American Football, Super Bowl Trophy, UEFA Champions League Trophy, FFL or Fantasy Football League Trophy. 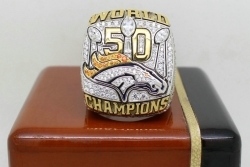 2015 Super Bowl 50 Denver Broncos Championship Ring The Super Bowl 50 Championship Ring boasts 212 round, tapered and marquise shaped diamonds all meticulously set in a 10 karat white-and-yellow gold ring. This collection of stones comes together to create a stunning ring that tops more than 5.05 carats. 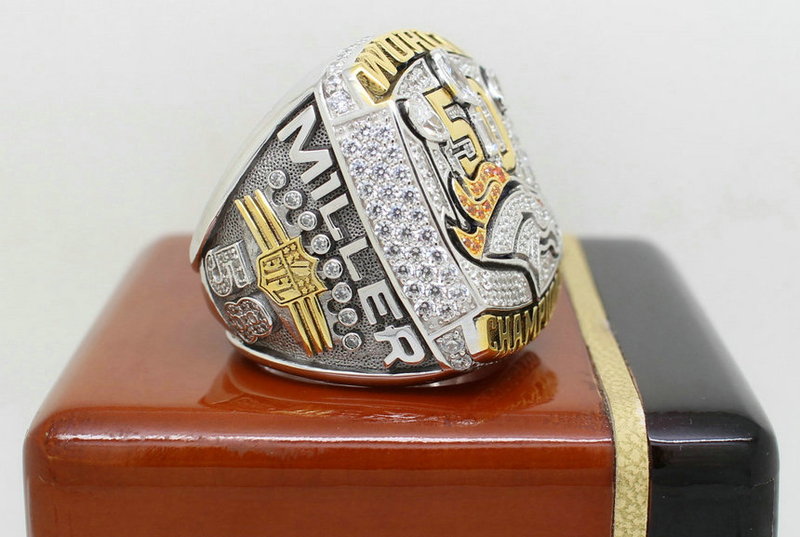 The ring top features the Super Bowl 50 logo and the team?s three Lombardi Trophies placed above the Denver Broncos logo on a field of pave-set diamonds. 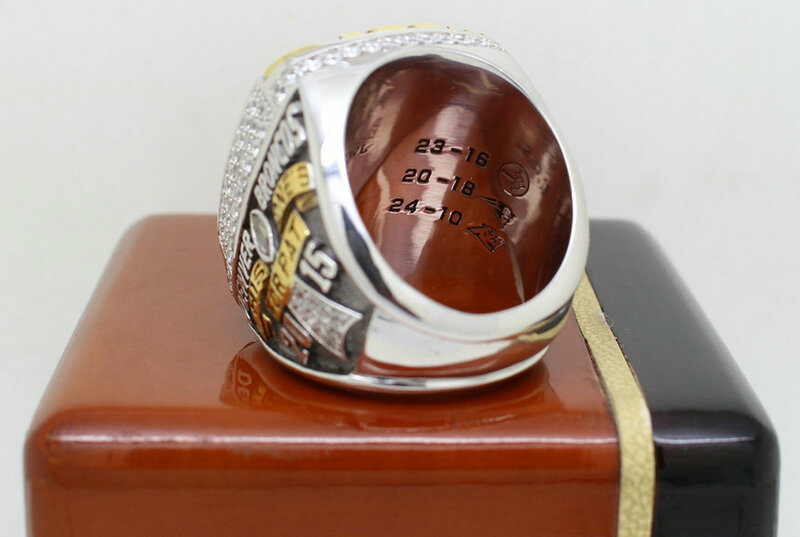 The trophies are created from marquise-cut stones, tapered baguettes and pave-set stones. 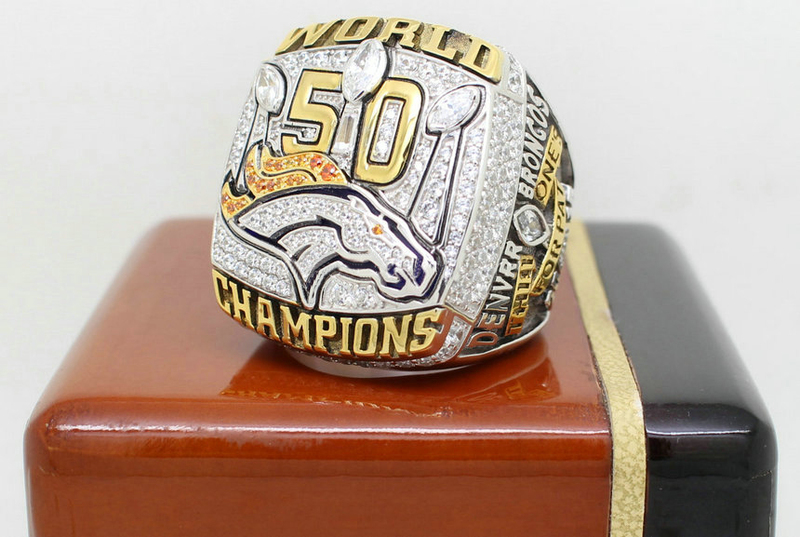 The Bronco mane is created from diamond-cut orange sapphires while the head features pave-set diamonds and a custom-cut corundum blue stone. 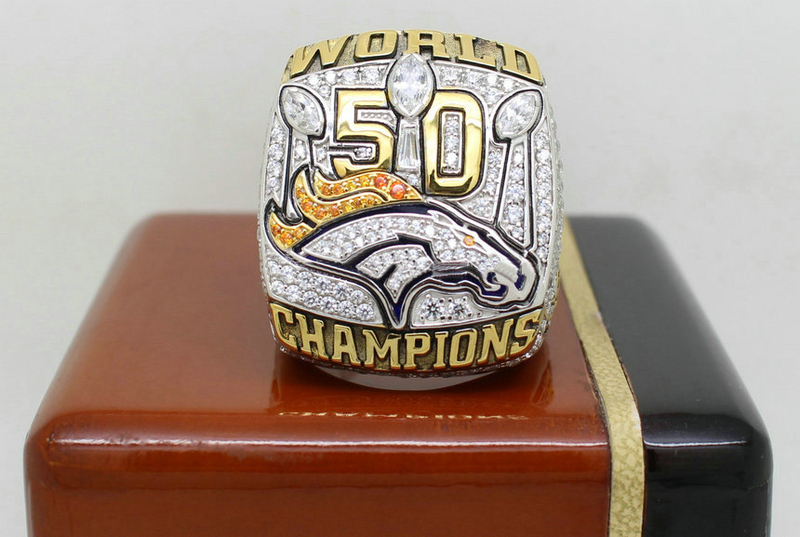 The words "WORLD CHAMPIONS" adorn the top and bottom edges. 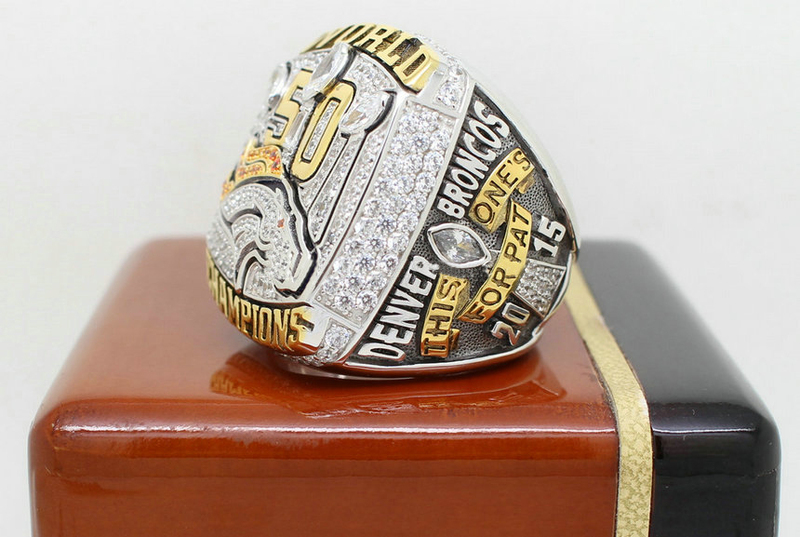 The sides feature 56 stones representing the Broncos? 56-year history and the top and bottom edges each feature 15 stones to mark the team?s 15 wins during the 2015 season and the 15 titles. 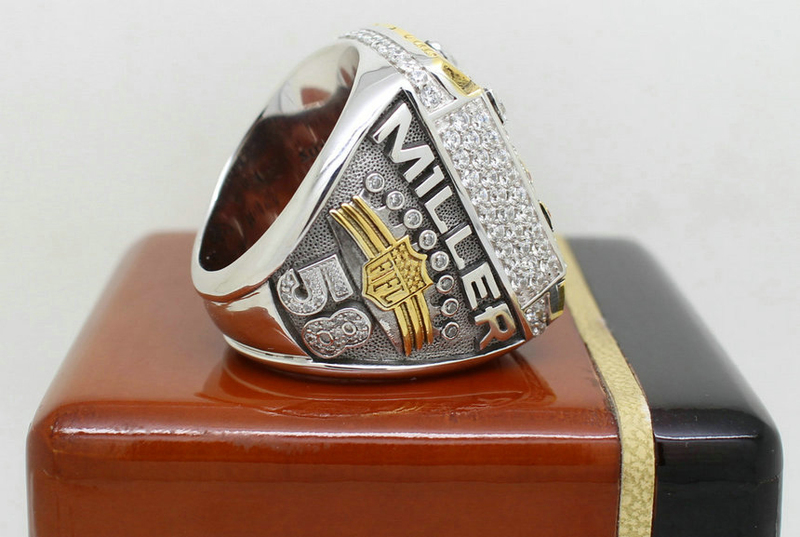 One side features the player?s number and their name above a crown highlighted in yellow to mark all three Super Bowl titles with eight round stones adorning the top of the crown to mark the team?s eight AFC Championships. 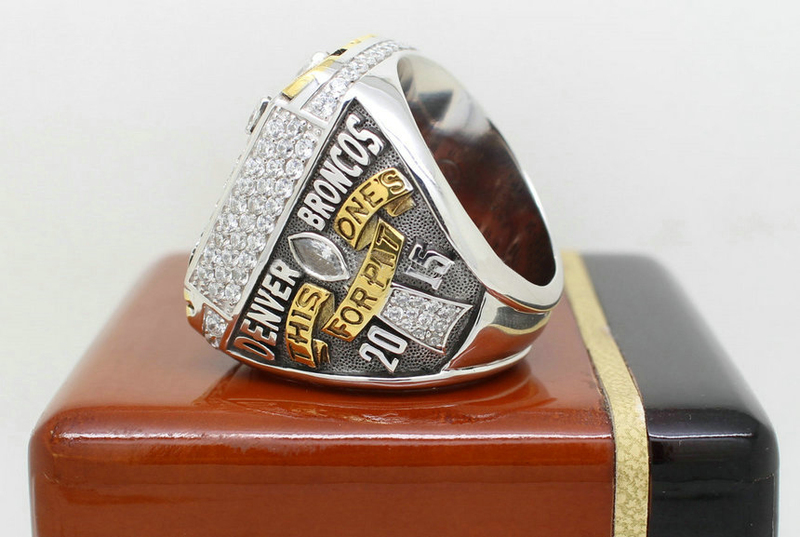 The other side features DENVER BRONCOS arched above an image of the Lombardi Trophy and the year 2015. The trophy is surrounded by the words ?THIS ONE?S FOR PAT? in honor of Owner Pat Bowlen.